“If you say a photograph is a thousand words,” he says, “you also have to ask a thousand questions before shooting one. In this era of propaganda, images have become a tool for confusion, if that’s appropriate. I needed something very three dimensional, that would give me a wider palette to experiment with, and photography wasn’t enough. I’m not a fan of printing images and putting them on the walls, because they feed into this idea of transactions. So, how can I go beyond.” The political subject and frenetic energy of Akinwande’s recent work seems to have emerged from the thinking above. On October 1, 2018, the anniversary of Nigeria’s independence from colonial rule, Lagosians in the ruling party, the All Progressives Congress, went to the polls to determine the flagbearer for their party in the 2019 general elections. There were reports that the incumbent, Governor Akinwumi Ambode had fallen out of favour with the party leader, former governor Ahmed Bola Tinubu, who was now supporting one of the aspirants, Jide Sanwo-Olu. That same day, Akinwande’s fifth solo exhibition opened at the Revolving Art Incubator (RAI), an alternative arts space located on Ahmadu Bello, Way, Victoria Island, Lagos. The exhibition was titled Power Show II: The God-Fathers Are Not To Blame. 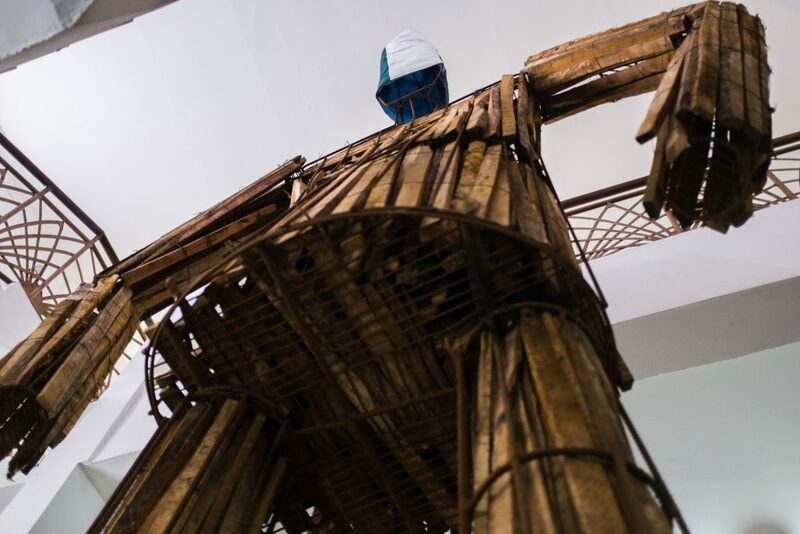 The centre-piece of this exhibition is a sculpture rising from the base of the multi-storey art space like an apparition from Nebuchadnezzar’s dreams—a giant that animates the idea of a big man that is tied to Akinwande’s concerns in Power Show II. In Power Show II, Akinwande does blow things up in the literal sense of the word. Beyond the nearly 30-foot sculpture standing in the stairwell, a display of an array of tweets printed on cards covers the wall of the exhibition space. These tweets contain complaints of Nigerians about the political system. Rants and analysis that have become a feature of what is colloquially called political Twitter. And tied to the railings is a speaker that pipes the voices of a bus stop into the stairwell, creating a juxtaposition of two expressions of the same public agitation. And there’s a dual reason Akinwande has done this. 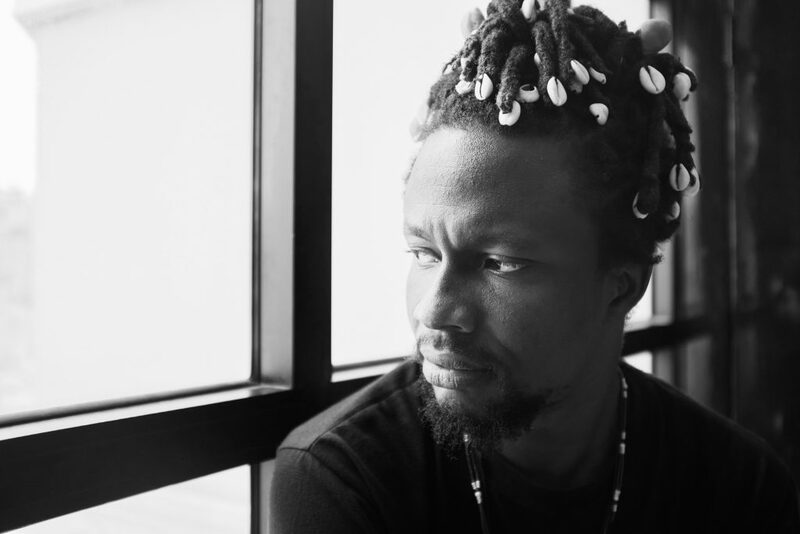 The second reason Akinwande has the sound of people talking as background music for his exhibition is that his training as an architect compels him to think about space. “I’m very detailed about everything,” he says, “in terms of layout, the work, looking at the space from the architectural point, the floor planning, movement and how people are going to react to the work.” Anyone can walk into and through RAI. There’s commercial activity going on all around: doors banging, feet shuffling and people calling out to one another. Another appeal of RAI to Akinwande is the potential for his work to be shown for months at stretch. Power Show I exhibited for less than three weeks. The feedback was good, he says, but his friends came to Lagos a few weeks after the exhibition was announced and wanted to see it, but couldn’t because it was already over. 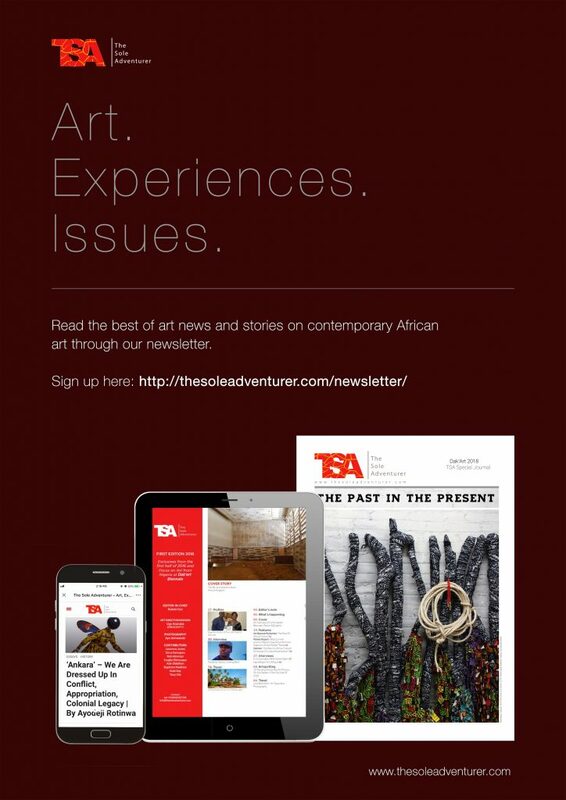 This short time frame is the norm for art exhibitions in Nigeria, and Akinwande wonders if this is because exhibitions in Lagos still skew towards the commercial. “Once you have the red dot and its sold, it’s already deemed to be successful.” He felt a waste of the energy he had used to install and execute the project, a sprawling work that he now describes as “scattered” because it contained disparate forms. “I felt very unfulfilled,” he says with a sombre expression. So, from that end of Power Show I, he started speaking with Jumoke Sanwo, the founder of RAI. 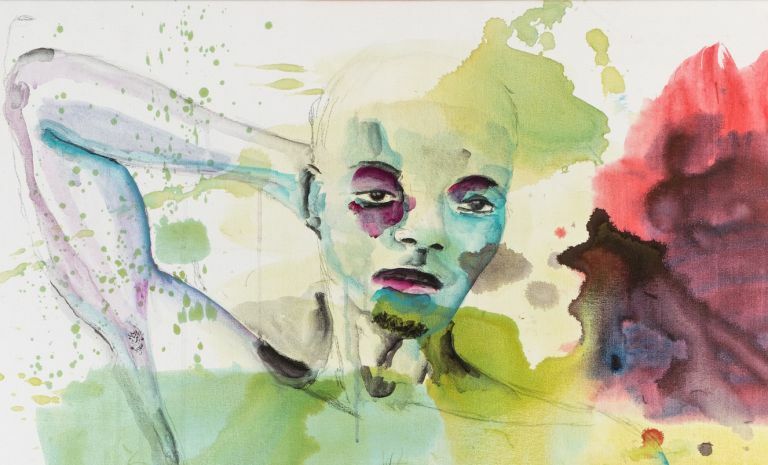 Power Show II evolved from conversations Akinwande has been having with himself for several months, but in the streamlined focus of the exhibited works, it’s obvious he is also thinking of the feedback he received after his first crack at the topic. His need to revisit the subject after the first exhibition, a by-product of that need for fulfilment mixed with a desire for more conversation, led him to find avenues for a sequel. He pondered a group exhibition, then a joint exhibition, before settling for a solo presentation, after which he changed topics before settling for The Godfathers Are Not to Blame. Through Sanwo, he met Njideka Iroh, who became the curator of the exhibition. Iroh had been aware of Akinwande’s work through an Ethiopian artist she met in Vienna, and she shares common friends with him. Iroh and Akinwande share this desire for the big picture. In thirty minutes of conversation, Akinwande touches on several variations of the spectre of colonisation. “The subject of godfatherism has always been with us, starting from colonial times,” he says. “The colonial project is even godfatherism itself.” He also alludes to this in his artist statement, which traces God-father from its Judaeo-Christian origins and ties it to ancient Greece, the source of both modern democracy and the Oedipal myth from which Ola Rotimi’s The Gods Are Not to Blame was cribbed. He translated that statement to pidgin, which he says is a decolonised language with a potency Fela Kuti, to whom he owes the title Power Show, understood before anyone else. 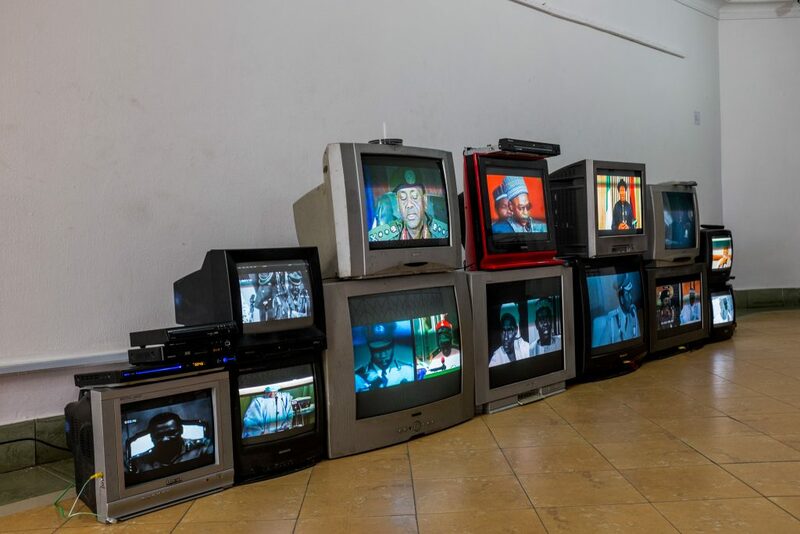 And it is Fela’s VIP (Vagabonds in Power) that inspires his display of Nigerian presidents on cathode ray televisions. Akinwande is invested in political conversations, “because those political manifestations affect our reality. And one thing that is missing in the Nigerian (art) scene is how we in this industry create works that actually critique or reflect the times.” He knew the opening of his exhibition would coincide with Nigerian independence and the run up to general elections, and wanted to engage with the period and conversations people around him were having both on the internet and in the streets. That the subject matched the Godfather-fever that greeted the primaries in Lagos state on Independence Day is the kind of serendipity that a preoccupation with the present can engender. To continue the conversation, the exhibition will feature three talks. One will be at a bus stop in Ketu, Lagos, where Akinwande often gathers his aural materials, during which he intends to speak to a newspaper vendor he considers an expert, “who incubates conversations” on the street. 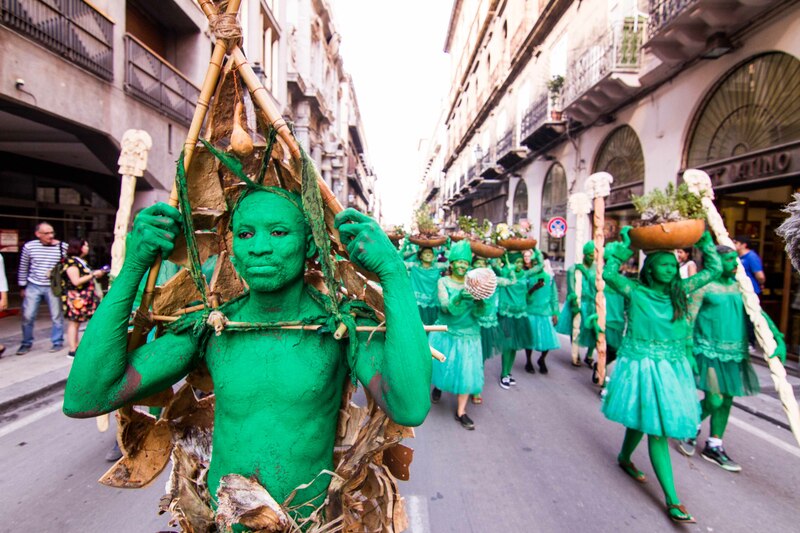 Another will hold at RAI during the ART X fair in Lagos, and a third will possibly hold in December or January. He intends to film all these talks and will continue to gather material as Nigeria goes deep into the political season. “You can’t control people’s opinions about something,” he says when I ask about feedback to the exhibition. “I’ve avoided having too much dialogue with people because the work is speaking so much and I don’t want my presence or words to get in the way.” But as we descend through the staircase of the exhibition space after the interview, Akinwande asks me what I think of the work. He listens to my response, and says, “that’s interesting” when I’m done. Then he asks what I think will become of the sculptures when the exhibition is over. For this, I have no good answer. Akinwande’s work is not the kind that can be bought by a private collector. 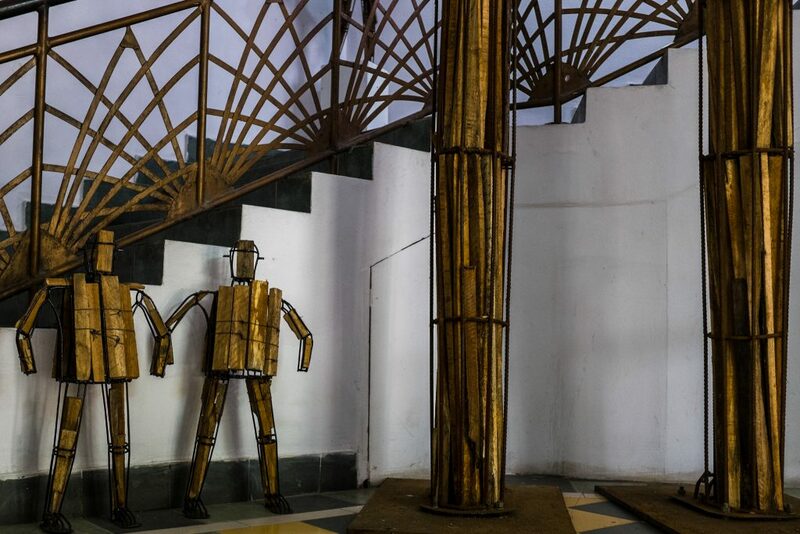 His Deaf & Dumb, another big installation which was exhibited at the National Museum after it featured in the 2017 Lagos Biennale, was booted out after Akinwande had a misunderstanding with the authorities at the museum. It is still looking for a home. After three months, he wagers the big man in this new exhibition will have to be pulled down and put in storage too. He talks about this like someone resigned to his fate. Reflecting on the activity of the past couple of years, he sighs and says after he’s done with this, he’ll have to take a hiatus. “2018 is for me to crystallise these ideas,” he says. “2019 will be a lot more reflective.” But if 2019 is filled with as much political intrigue as many Nigerians think it will, I think that reflection might be more outward than Akinwande projects. “Power Show II: The God-Fathers Are Not To Blame” is open until the 31st of December 2018.